Helping 35 children's organizations & sponsoring 3 college scholarships. The 2018 Rock for Tots line-up has been announced. 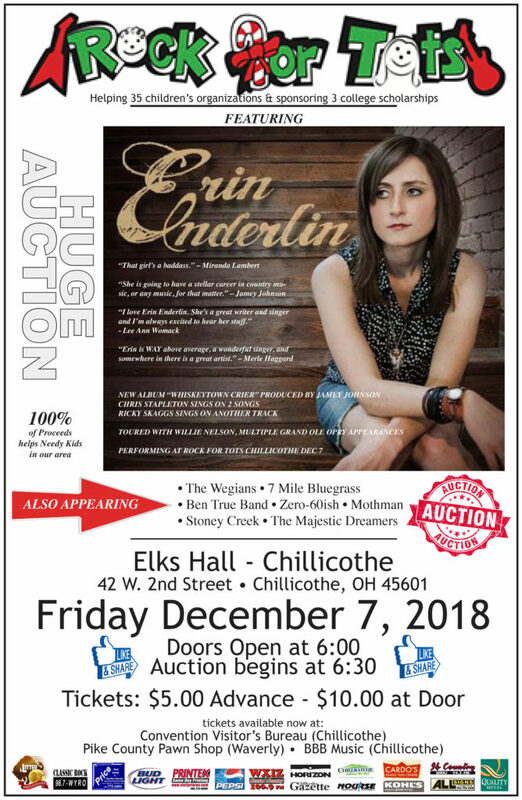 This year, Erin Enderlin will be performing along with The Wegians, 7 Mile Bluegrass, Ben True Band, Zero-60ish, Mothman, Stoney Creek, and The Majestic Dreamers. 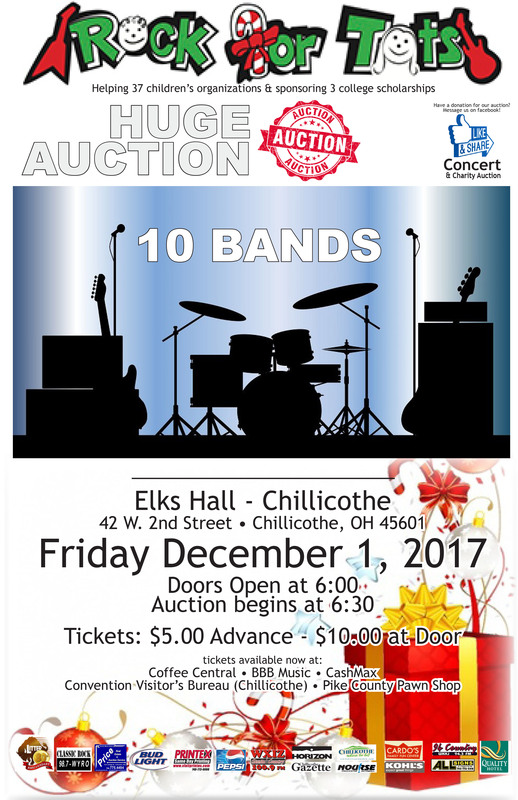 Get your tickets now for a night of fun and be part of a Chillicothe tradition! 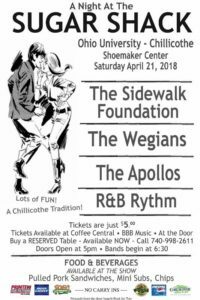 A Night at the Sugar Shack is an evening of music and entertainment to raise money for Rock for Tots! 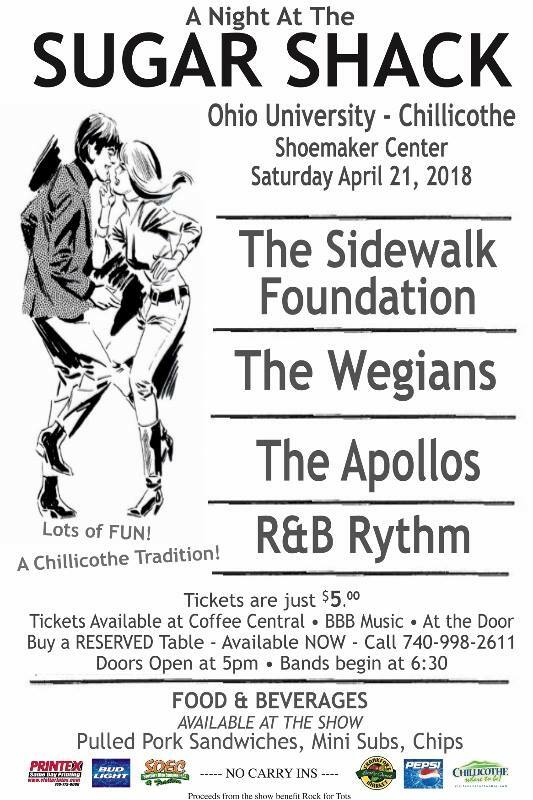 Tickets Available at Coffee Central, BBB Music or at the door! Reserve a table by calling (740) 998-2611. Rock For Tots had an outstanding year culminating in our 32nd Annual Concert & Charity Auction. 100% of these proceeds will be distributed throughout our community to various children's programs. We will also be purchasing food, toys, clothing, supporting educational programs, mentoring programs, college scholarships, a college endowment program and much more. THANK YOU to everyone who attended, the bands, donors, sponsors, advertisers, and our friends in the media who helped promote our events. The mission of Rock for Tots is to positively impact our community by providing assistance, empowerment and opportunity to area children's organizations as well providing confidence building through the initiation and support of music, mentoring and educational programs. Rock for Tots, Inc. is a 501(c)(3) non-profit organization based out of Chillicothe, Ohio. 100% of proceeds goes directly to 30+ organizations to help the communities of southern Ohio.